Don Lockwood (Gene Kelly) and Lina Lamont(Jean Hagen) are the sweethearts of the silent movie era. But when they make their first talking picture, complete with singing and dancing, Lina's voice doesn't hold up. 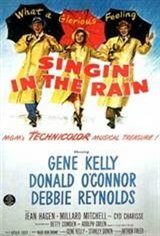 Though Lina is really in love with Don, he falls for an aspiring actress, Kathy Seldon (Debbie Reynolds). Don and his best friend and piano accompanist Cosmo Brown (Donald O'Connor) decide to dub Kathy's voice in for Lina's. The love triangle begins to stir up trouble for the song and dance production when the crew discovers Lina's secret and tries to hide it from the world.